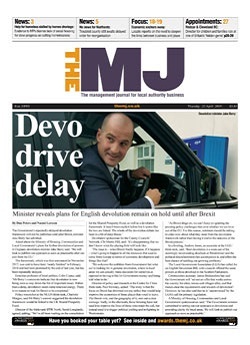 The Government’s repeatedly-delayed devolution framework will not be published until after Brexit, minister Jake Berry has admitted. Councils and the Government are at loggerheads over who is to blame for a 17-month delay for a decision on a devolution growth deal. As local government stays stuck in the inertia of Brexit, wouldn't it be better to imagine a devolved world, asks Heather Jameson. If the Government wants councils to rebuild places after Brexit, it will need to be swift, she adds. Scottish and Welsh ministers say they are still ignored by Westminster despite 20 years of devolution, according to a report from the Institute for Government. The Treasury should develop a new national place-based Spending Review, the independent Royal Society for the encouragement of Arts, Manufactures and Commerce (RSA) charity has argued. Labour local government has been hit by a raft of resignations after seven MPs resigned from the party to form The Independent Group. Only full fiscal devolution with comprehensive tax-raising powers at a local level will deliver the change communities crave, a report by the NLGN think-tank has urged. Dr Jack Brown asks what role local leaders can play in strengthening ties between London and the world beyond the M25. More devolution of powers is essential to realise Greater Manchester’s economic potential, a group of experts has said. The Liverpool city region combined authority is to levy a council tax precept for the first time. Northern Powerhouse minister Jake Berry’s support for devolving tax-raising powers to the regional level has been welcomed by the New Local Government Network (NLGN). Those pursuing further devolution are facing an uphill struggle, the chief executive of the Greater Manchester Combined Authority has suggested. The introduction of a 0.25% sales tax in Denver is ‘further proof of the need for devolved political power in the UK,’ a local government finance expert has suggested.